Spring marks the time for the annual Bonehead Enduro. Introduced in 1994, the event is a tribute to older riders and older machines. Riders over 53, or owners of pre 70s bikes are encouraged to participate. ID's are not be checked, so virtually anyone licensed to ride can sign up for this fun romp through the mountains around Snoqualmie. At the center of it all is a scavenger hunt. Riders check in early in the morning and get a clue to find the first "bone." By the end of the event they have typically located up to ten bones (depending on the year) and a few bonus bones. The course changes each year, but typically takes you along dirt roads north of North Bend. The supposed unimproved dirt roads are actually in quite good condition most years. We covered the 2000 event on a Honda Helix and were impressed to see other street machines such as Harley-Davidson's and sidecar rigs running the course. The bones themselves aren't actually bones, but numbered slips that correspond to the number you are assigned at check in. Riders are given about three hours to locate all the bones and return to the starting point in Snoqualmie. Each bone has a different name such as the "Hollow Log Bone", "Mountain Goat Bone", and the coldest bone of all, the "Big Snow Bone" which can only be obtained by riding up Prospector's Ridge along the snowline. Each rider who picks up all the bones gets rewarded at the end with a "Bone" award. 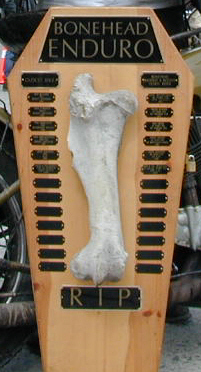 The oldest rider and owner of the oldest bike are both rewarded by having their name included on a coffin shaped box/plaque that features a large bone attached to the front of it. In 1998, 52 riders rode, but by spring of 2000 the number of entries was 72. The event is getting more popular each year with riders both young and old participating. The lineup of bikes is stunning from a vintage point of view. 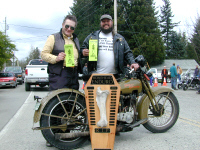 The 2000 oldest bike winner, Randy Jamison, sported a 1928 Harley-Davidson. Also in the herd for 2000 were vintage many Japanese, British and American iron from AJS, Norton, BSA's Triumphs, Hondas and otherwise. Obviously there are breakdowns along the way. Each year someone's bike drops a tailpipe, headlamp or some other vital organ. Never fear, as a few trucks follow the pack to clean up and load up breakdowns. The course conditions vary from year to year. More rain means more mud for the "Mud Bog Bone" and less daring riders are encouraged to park their bikes dry side of the bog and walk back to retrieve the bone. Dig out your old bike and come have some fun! Assistance with this story was provided by Tom Samuelsen. For the exact date of the next Bonehead Enduro, visit the Sound RIDER! Calendar.